DAUGHTERS to sell! Daughters to sell! What wealthy young nobleman wants a mate? Here's fine daughters, my daughters, oh! Choose out your partner, whichever you please. Beautiful daughters, dark and fair! At St. George's Church by Hanover Square. And no end of acres of crinoline. In short all that she's been brought up to at home. Here are girls for your money - if out you can shell. My daughters to sell! My daughters to sell! Helen (19). 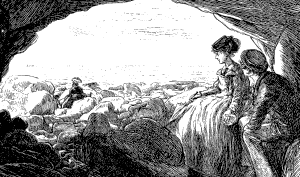 "OH, I SAY, COUSIN GEORGE, IF IT WASN' T FOR 'MA SITTING THERE, WOULDN'T THIS BE LIKE THAT BEAUTIFUL CAVE IN CHARLES READE'S 'FOUL PLAY' WHERE YOU KNOW ---"
[Cousin George (ditto) was just going to say that the same idea had struck him, &c., when 'Ma rose, and called out it was time to go home to tea!